The Centre consists of two halls and a lounge which are all available for hire. Entrance is through a large, informally furnished foyer which is ideal for greeting your guests on more formal occasions, and our gardens would make a suitable back-drop for your photographs The main hall has a seating capacity of around 200. It has a stage which is fully equipped with lighting, power points and extractor fans. This hall has a fully sprung floor, ideal for dancing. A CD/tape player is available for hirers use. The small hall has a seating capacity of approximately 100. It gives access to the patio area which can be used for BBQ's etc. Contained within the small hall is a kitchen which is equipped with a fridge, cutlery, crockery and microwave ovens. This hall also has television and CD player for hirers use. Additional toilet facilities are adjacent to it. The main kitchen is fully equipped with a double oven cooker, fridge, dishwasher and two microwave ovens. There is also enough cutlery and crockery for 100+ people The lounge is a smaller room which is ideal for meetings etc. This room is also equipped with a television. The two larger halls can be equipped with overhead projector slide projector, flip charts and screens Both halls come with subdued lighting and a loop system for the hearing impaired The centre has full toilet and washroom facilities, including toilets for the disabled. Also a baby changing facilities. 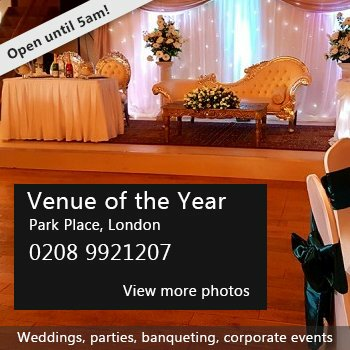 The two main halls are available for meetings, seminars, conferences, weddings, parties, dances, dog shows, children's parties, flower shows etc. We can provide details of catering and bar facilities, discos, entertainers etc, to aid the planning of your event. There have been 0 reviews of New Haw and Woodham Community Centre. If you would like to send New Haw and Woodham Community Centre a booking enquiry, please fill in the form below and click 'send'. Perhaps some of the following halls within 5 miles of New Haw and Woodham Community Centre would also be of interest?